This option is available after the faculty account has been created. 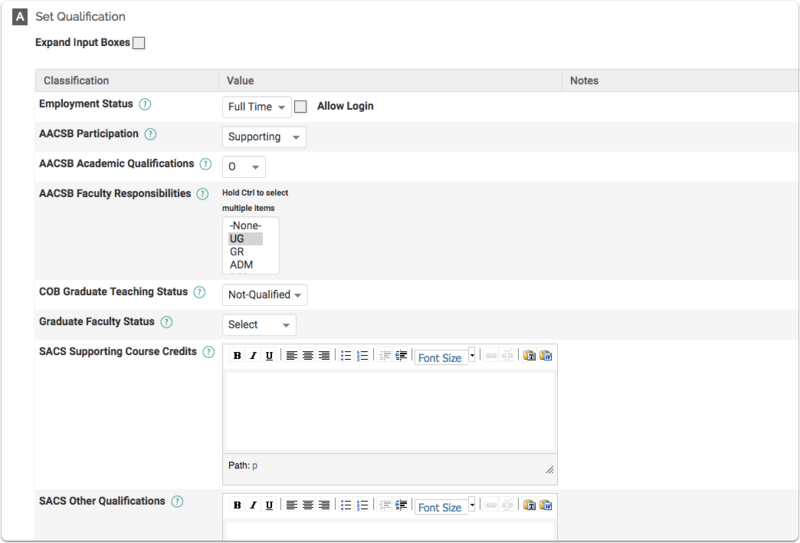 During manual creation of a faculty account, the faculty classifications are part of the Input Form. On the Admin section of the navigation menu, click Administration > Add/Edit > Faculty. Click the unit associated with the faculty member to be edited. The Manage Faculty screen displays. All faculty members assigned to the unit are listed. Scroll down and click the link titled Set Faculty Classifications (under 6 - Faculty Classifications). The Set Faculty Classifications form displays. The heading indicates the beginning semester for which the faculty classifications will be updated. Keep in mind the faculty classifications will be updated beginning with this term and every term forward. Enter the data for the faculty classifications, as needed. Click Save and Go Back to save the changes.